Hello! Happy middle of October! Have you broken out any fall gear yet? 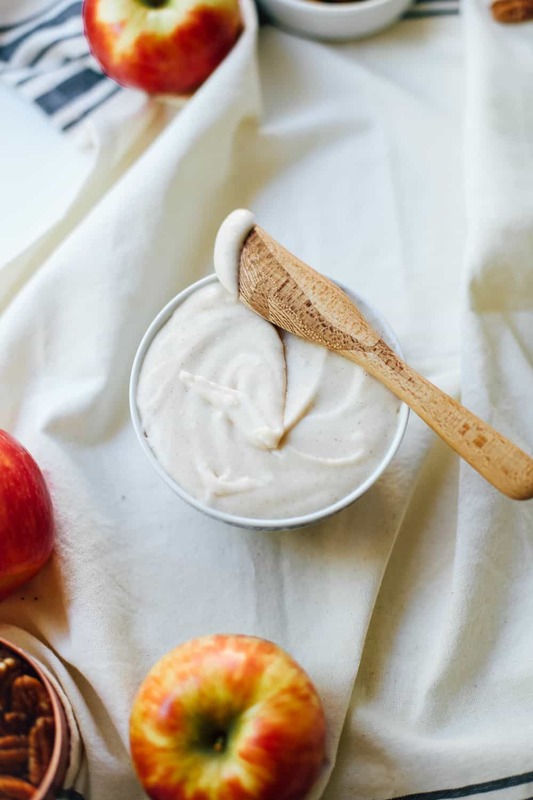 It is still quite deep in the 80-degree temperatures here in sunny Orange County but I am so excited to start kicking off some fall recipes on the blog! But even more excitedly… this is my first ever post styled, created and shot in my new little house! YAY YAY YAY! I guess I am fully living up to the ‘house’ in college housewife. Did you guys know when I first started the blog I would get emails saying how proud people were that I was in college and had children, I still find it so funny. Okay back to the new kitchen… Even when the blog was only a few months old I dreamed about shooting in a house one day. My apartment kitchens have always straight up sucked. While I don’t have a dishwasher in this little 1929 abode of ours we do have so much cabinet space and it makes my prop hoarder self insanely fuzzy inside. I have drawers just for little bowls! Because if you’re a food blogger you probably have an abnormal amount of little bowls! Ha! Believe it or not, I actually shot the recipe scene in my laundry room! It is the room just off of the kitchen and it has a massive window making it totally ideal to shoot my recipes. I propped this little scene up on my new whirlpool washer and dryer (which I’m casually in love with). In some ways I feel like I swapped out my dishwasher for a washer and dryer, which I am actually easily adjusting. You guys know I was in love with my little apartment but our .25 mile walk to do our laundry was less than ideal. Can any of my apartment living readers relate with this?! Well hang in there friend, you too will have a washer and dryer one day as well! Other than nesting and finding my favorite little nook and crannies of my house, I have also been working up lots of fall content! Stay tuned next week for a spiced white owl and a new pumpkin pasta recipe coming. 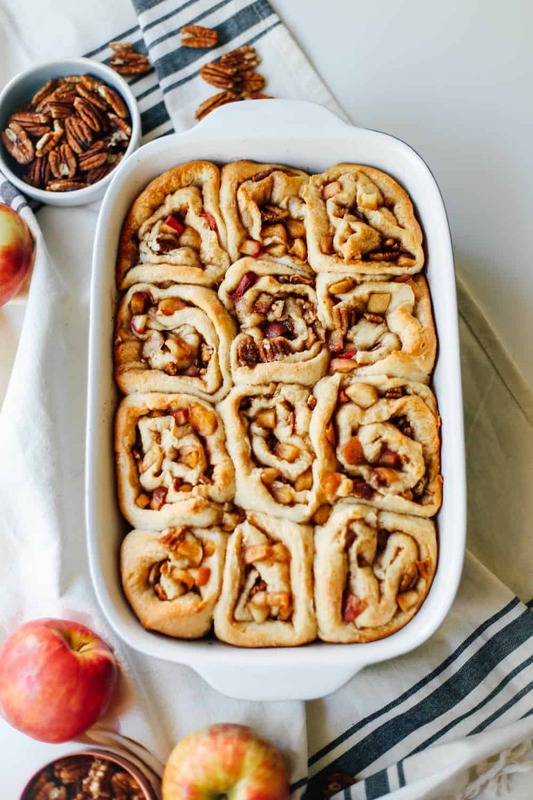 This week we are kicking off the week with apple pecan cinnamon rolls! When it comes to cinnamon rolls I really don’t mess around. I take a strong note from Paula Dean (don’t forget to buy extra butter this week) and never skimp on the filling or the icing. 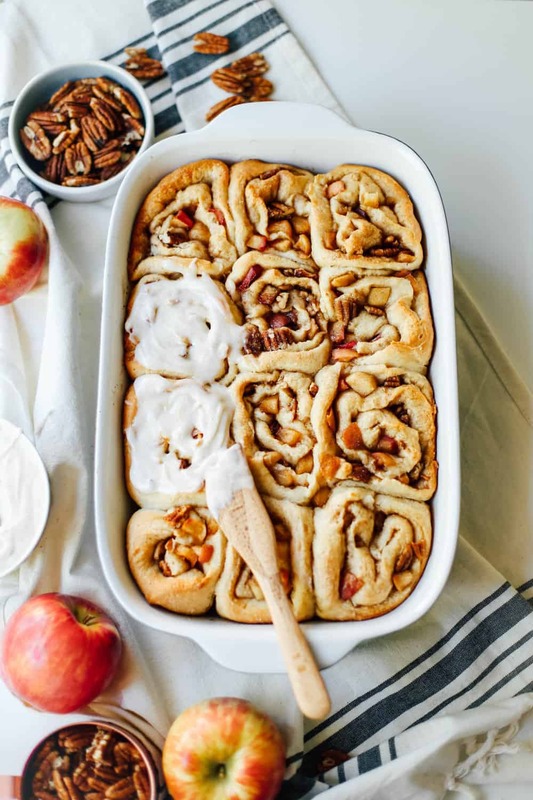 I wanted these apple pecan cinnamon rolls to taste like pecan pie and apple pie had a baby. And they 100% do. 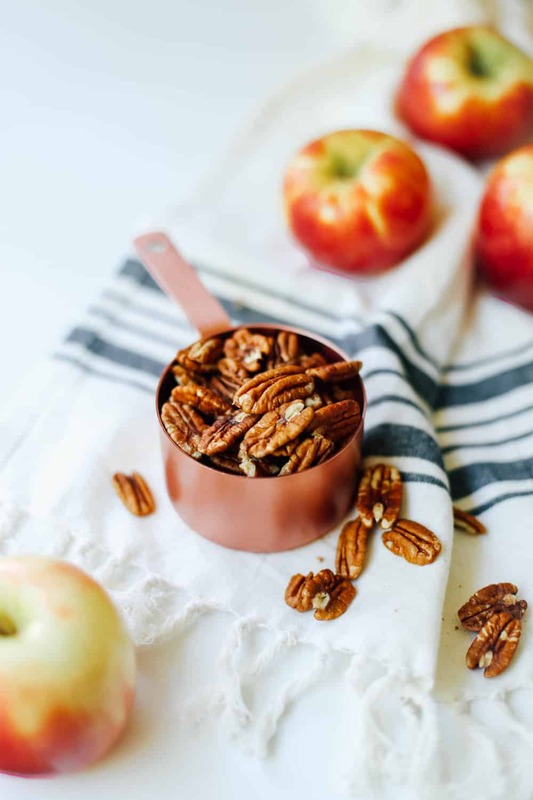 I used a really great combo of honey crisp apples and pecans with plenty of spices swirled in for that ultimate gooey cinnamon roll filling. You could totally swap out pears if you wanted or any other kind of nut! Keep a close eye on them as they bake. If they get a little too brown or burn they can try out super fast and they won’t keep very well! Now, for the Cinnamon cream cheese icing! I’ll be honest… After I took the shot so you could see the full thing I literally doused the whole pan with the cinnamon cream cheese icing because it’s SO GOOD. What good is a cinnamon roll without the frosting?! I added cinnamon and a pinch of nutmeg to the icing but you could totally do pumpkin pie spice too! Dissolve yeast into hot water. While yeast is dissolving combine sugar melted butter, salt, and egg into a large bowl. Mix in two cups of flour and then mix in yeast + water mixture. Stir in warm milk to dough mixture. Mix in remaining flour until dough is easy to handle. The dough should be elastic but not sticky. Sprinkle flour over a large surface and knead for 5-10 minutes. Place in a large well-greased bowl (I sprayed mine with Pam) and cover with two clean dish towels without touching the dough. Place in a dry area for an hour to double in size. Preheat oven to 350 degrees Fahrenheit. While dough is rising, heat a medium saute pan over medium-low heat and melt 2 tablespoons of butter. 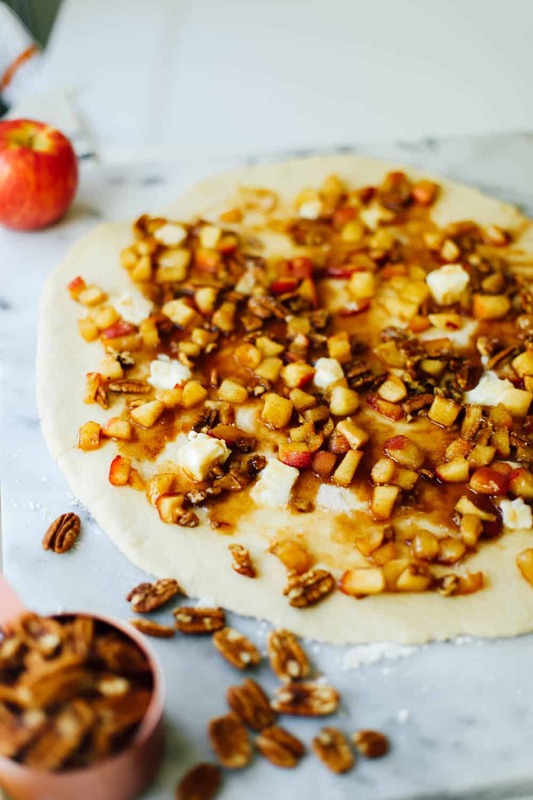 Add in apples, 1/2 cup of brown sugar, 1 teaspoon of cinnamon, and crushed pecans. 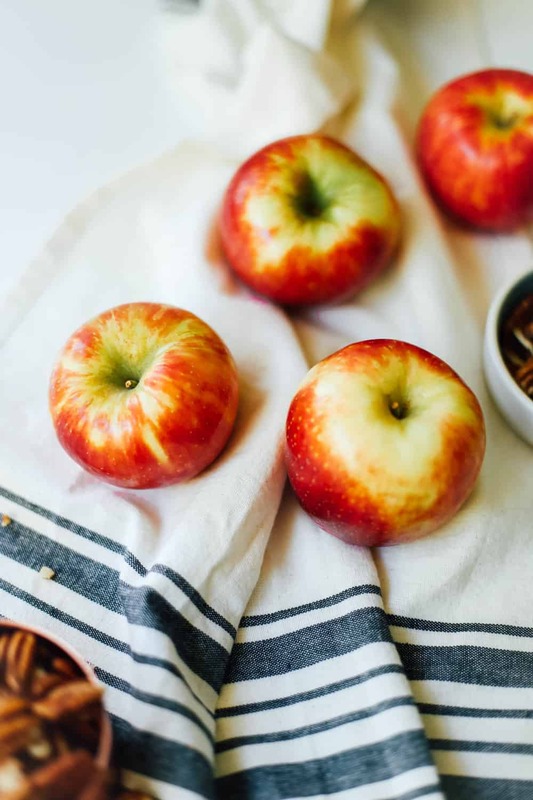 Cook for 5-10 minutes or until apples have softened. Punch down the dough and roll out into a large 15×9 rectangle on a floured surface. Spread evenly with apple pecan mixture, cubed butter, cinnamon sugar mixture, and roll (on the 15 inch side)! Cut slices about 1 1/2 inches thick and arrange close together in a greased casserole dish. Bake for 25-30 minutes or until lightly golden. In a large bowl fitted with a hand or standing mixer add in room temp butter, cream cheese, vanilla extract, and salt. Beat for 2-3 minutes. Add in 1 cup of powdered sugar at a time and 1 tablespoon of half & half after every sugar addition. Add in cinnamon and nutmeg last to your taste. 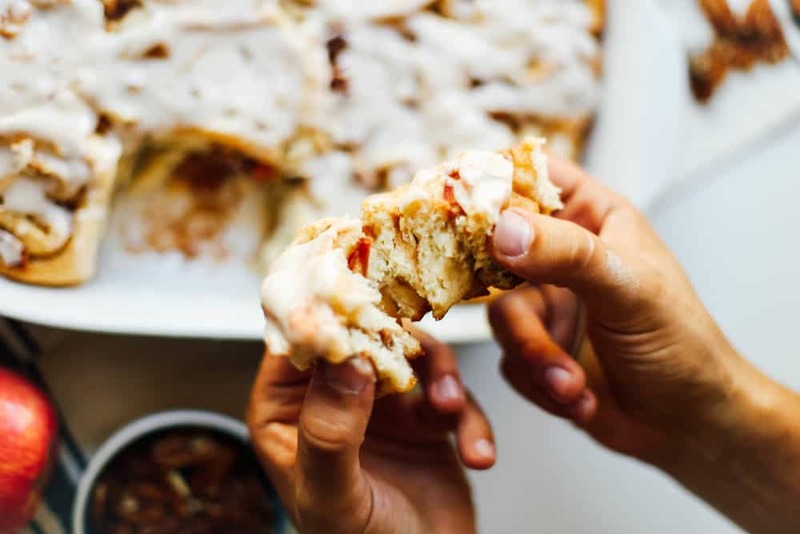 Smother onto warm cinnamon rolls! Previous Post 5 Favorite things to do in Old Towne Orange! These look DEVINE! 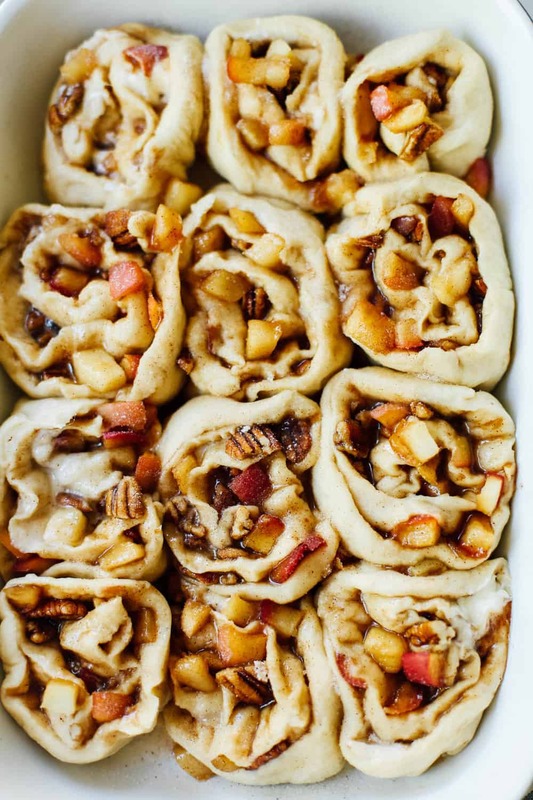 I want to make these for my coworkers… Do you think I could prep everything the night before & bake in the morning? Hi! I made these as a trial run for Thanksgiving family festivities and they were a huge hit! So yummy! We loved the cinnamon icing and crunch of pecans. I have one question though, what is the milk for? I followed along the step by step recipe (thanks for that) but once my dough was rising, I noticed the milk on the list of ingredients and slightly panicked. Fortunately, they were delicious anyway!